Some time ago I worked on a few pages of The Salem witchcraft, The planchette mystery, and Modern spiritualism, a collection of articles reprinted by the Phrenological Journal. It got me intrigued, so when I was notified the other week that it was available for smooth reading, I downloaded it. The book contains three articles, as indicated in the title. The first article: The Salem Witchcraft, was what got me so intrigued back then. I had heard of the Salem witches, but never actually knew what happened there, so this was my chance to find out. The article is a review of the work of Charles W. Upham. I think it is adequate to say that it is a summary of his work, although I am not (yet) familiar with his books. But back to the article: it certainly gives you a very good idea of the people, the circumstances and the goings on in Salem and surrounding areas. You can use it as an introduction to the Upham books, or as a good overview if you don’t have the time or inclination to go into too much detail. It certainly left me counting my lucky stars that I didn’t live there and then. The planchette mystery had me in stitches. It was a welcome distraction after the Salem horrors. 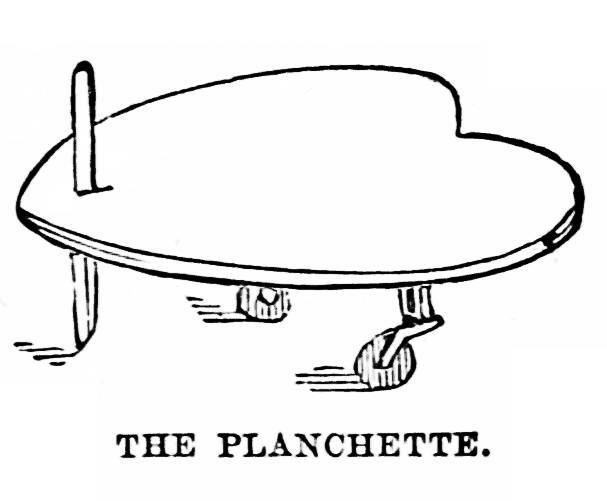 The author tries to lift the mystery of the Planchette. If, like me, you don’t know what a Planchette is, you’ll be a lot wiser by the end of the article. I got to know where it got its name, what it does, even how to use it. The author of the articles goes to great lengths to show the flaws in theories which don’t fit his conviction, demanding proof of them, while at the same time failing to give a single proof himself. However, he lists lots of examples of the wondrous results when using a planchette. It must indeed be a tiny miracle. You can have a nearly philosophical discussion with it, and it will answer you (well, it answered the author) in intelligible sentences up to 300 words of length. Go figure. I want a planchette now. The article about Modern Spiritualism, written by Harriet Beecher Stowe of Uncle Tom’s Cabin fame, rounds the book off. Mrs Beecher Stowe is a devout Christian and as such has a word or two to say about spiritualism. She laments that the churches don’t go back to their roots and have no comfort to offer, thus involuntarily helping bereft people to search solace in spiritualism. She compares the beliefs and traditions of the primitive Christians of the beginning of Christianity with the Christians of the (her) present day and shows how spiritualism wouldn’t stand a chance if only people still knew that there were angels, Satan and miracles, as Jesus and the Apostles knew. Nobody would ever have to lament a beloved one who died because … but read for yourself. At first, I thought it was an odd compilation of articles, but on second thoughts I realised the ingenuity of it.